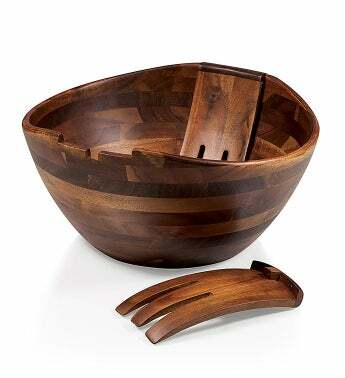 Serve the salad with spice and flare with the Fabio Viviani Mescolare Oversized Salad Set. With dark, finished wood and a sleek shape, dinner parties just got fancier. Dimensions: Tray: 13" x 13" x 6.5"
Care Instructions: Surface wash only with a damp cloth. To prevent wood from warping and cracking, do not submerge in water. Hand wash knife and towel dry immediately after washing. Not dishwasher safe.